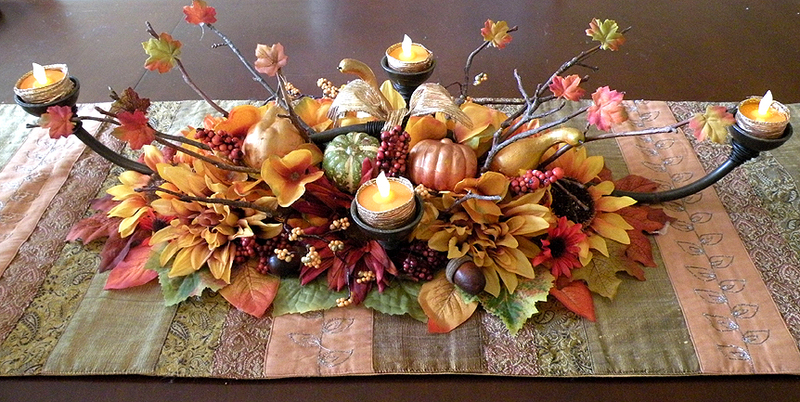 I have been very busy this week finishing all of my Thanksgiving decorations and preparing for two TV segments. 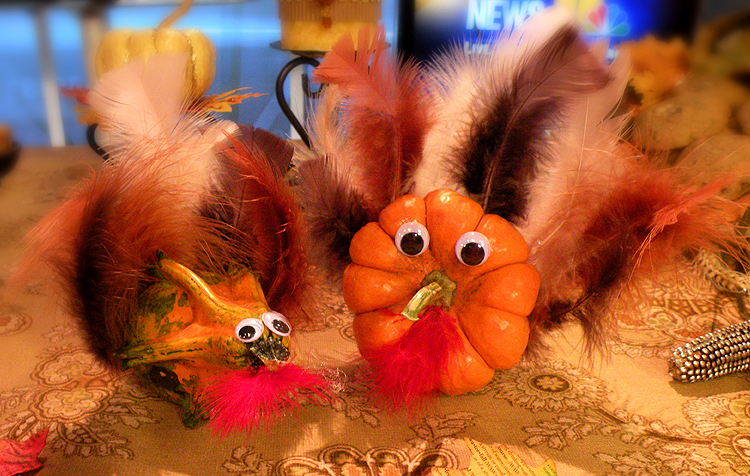 I will be on News Channel 8 in Washington DC tomorrow showing more of my Thanksgiving ideas. 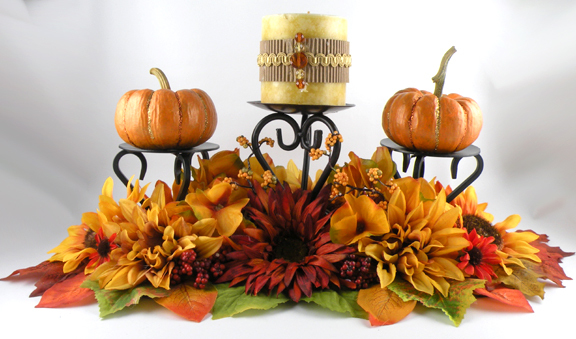 I tend to create faster than I can blog so I am posting five of my easy and economical decorations I created for Thanksgiving all at once. Sometimes the simplest things I create are the ones I end up liking the best. I hope you enjoy them. I would love to hear what you think of my ideas. 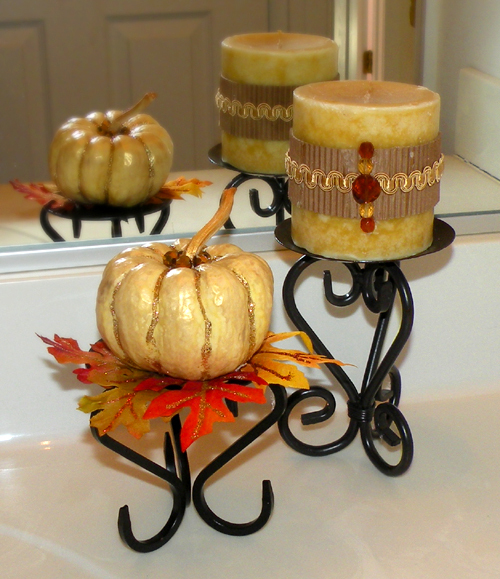 I used an existing candle holder to create this centerpiece. I cut out an oval piece of cardboard and glued fabric flowers and leaves to it to create the base. I nestled the candle holder onto the flowers and attached sticks I gathered from the woods. The gourds are from the dollar store and I dressed them up with gold and bronze paint. I finished the design by adding Halloween battery tea lights wrapped in gold ribbon and a few fabric leaves to the sticks. The cost to create this centerpiece is less than five dollars because I used on hand items, natural elements, dollar store finds and flowers on clearance at the craft store. This is such a simple idea but I love it. I painted corn leftover from Halloween with gold and bronze paint. I think it came out very elegant. Metallics are big this year in fashion and in decorating so I though why not create my own version for less than a dollar. I used acrylic paint from the craft store and a foam brush to achieve this look. 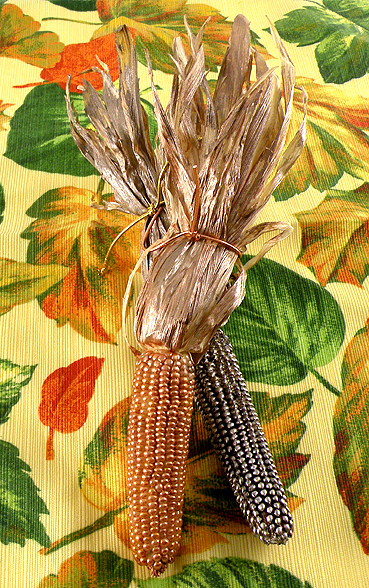 This corn would dress up a powder room, buffet table or anywhere where you just want a little accent piece. This is a quick and easy way to add a touch of charm to your powder room. Again I used a Halloween pumpkin decorated with glitter glue and beads. I also brushed a little metallic paint on the pumpkin to make it look fancier. I added some glitter glue to the veins of the leaves to dress them up. I decorated the candle with a coffee sleeve, a ribbon scrap and beads. This didn’t cost anything to make because I already had all of the supplies. This entry was posted in Crafts, Everything, Recycle, Uncategorized and tagged centerpiece, Gina Tepper, gourds, pumpkins, reuse, sticks, Thanksgiving. Bookmark the permalink. Those are all lovely. Great ideas.